In most of the research on pseudo-haptic feedback, subjects’ hands are on the desk and the visual image is provided from a monitor placed in front of them. The setup easily induces sensory conflicts for pseudo-haptic feedback between visual and haptic perception. However, subjects rarely see simultaneously their hand in motion and in a visual display. We report here our preliminary study on pseudo-haptic feedback related to tactile perception of softness. 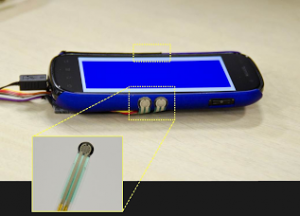 In the study, subjects hold a hand-held display with pressure sensors. A virtual object shown on the display screen changes shape according to pressures from the subject’s squeezing of the device. In this configuration, subjects are able to see their hand and the visual display at same time. We also describe the preliminary experimental results confirming the feasibility of our system and its applicability in investigating haptic pseudo-haptic.